Krakow, 20 April 2016 The chaos typical of liquid molecules, and the ordering characteristics of crystals. There are states of matter connecting such contradictory features: liquid crystals. Thanks to an innovative application of antimatter, it has been demonstrated at the Institute of Nuclear Physics of the Polish Academy of Sciences in Krakow that the structures formed by certain molecules of liquid crystals must in fact be different than previously thought. Liquid crystals are found in many areas of technology, and in future, their use will likely grow, for example, as organic semiconductors. But to make this possible, we still need to conduct basic research using a variety of experimental techniques in order to reveal the structure of these compounds and their dynamics. 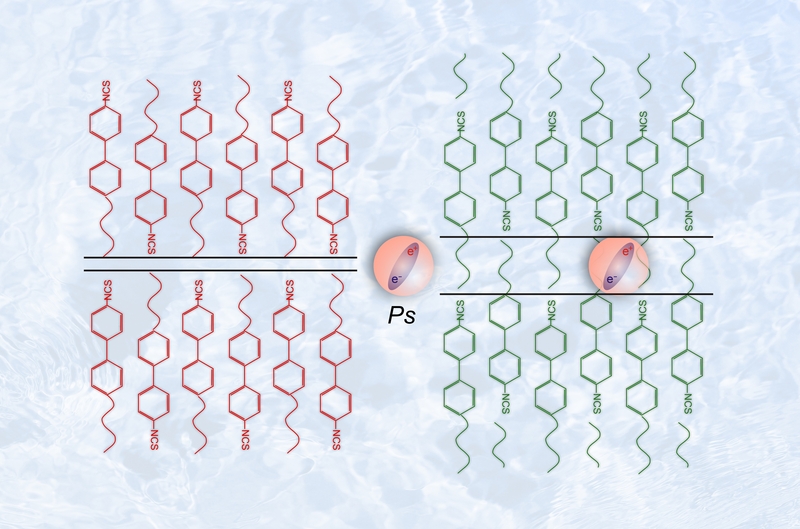 To this end, new experiments have been conducted on the quenched smectic-E (Sm-E) phase of liquid crystals at the Institute of Nuclear Physics of the Polish Academy of Sciences (IFJ PAN) in Krakow. Smectics of this type are composed of well-ordered particles separated into layers. Up until now it was thought that the distance between the individual layers of particles was very small. Research conducted by the Krakow physicists helped to verify the correctness of current models and precisely determine the crystal-like phase structure. "We have employed an interesting measurement technique rarely used in the case of liquid crystals. The method uses the specific characteristics of positrons, which are antimatter counterparts of ordinary electrons," explains Dr. Ewa Dryzek (IFJ PAN). A positron as the antiparticle of an electron has a positive charge. When a positron meets an electron it may lead to annihilation, where the mass of both particles converts into electromagnetic radiation with a characteristic energy. "In the world of ordinary matter, antimatter is produced by physical processes only in trace amounts. In the course of our measurements we used positrons created in radioactive decay of the isotope sodium 22," says Dr. Ewa Juszynska-Galazka (IFJ PAN). Positrons of a radioactive source penetrated the test material, in which they encountered electrons. Before the annihilation of a positron and an electron pair, an exotic atom called positronium can form. In soft matter such as liquid crystals or polymers positronium may be formed in nanopores, which are small voids between molecules. Measuring its lifetime, that is, the time between the emission of a positron from a radioactive source and its annihilation, allows us to determine the size of the nanopores. The smaller the nanopores, the faster the annihilation occurs. Research at IFJ PAN (made possible thanks to previous cooperation, among other endeavours, with Dr. Bozena Jasinska's group from the Institute of Physics of the University of Maria Curie-Sklodowska University in Lublin) concerned positron irradiation of a compound called 4TCB, which unlike many other substances does not crystallize with a decrease in temperature, but with an increase. The results showed that in the material positronium is formed. However, given the existing model arrangement of molecules in the Sm-E phase, it was difficult to identify the place where it could be accommodated. "Our measurements show that positronium's nanopores are the size of approximately six angstroms, that is, six 10-billionths of a meter. These results were consistent with one of the variants of the new model of Sm-E, which only recently has been proposed by Prof. Kazuya Saito's group from Japan," says Dr. Dryzek. Measurements have confirmed that the alkyl chains - 'tail' of molecules - are in a liquid state, and so have freedom of movement like in an isotropic liquid. It is worth mentioning that in liquids, as a result of interaction with the surrounding molecules, the positronium repulses the neighbouring molecules or their parts to produce a small empty space around itself. Such an arrangement can be imagined as a bubble with positronium in its center. The Japanese Sm-E model, proposed on the basis of calorimetric tests and the diffraction, assumed that the liquid crystal molecules are arranged in two layers: the first comprised of rigid phenyl rings, the other of alkyl chains. "At this point all the information began to fit together! Positronium can produce a bubble in the layer containing the alkyl tails, as they are in the liquid state. The size of the resulting bubble corresponds to the width of the layer," says Dr. Dryzek. Temperature measurements of the positronium lifetime confirmed that at low temperatures (liquid nitrogen) quenched 4TCB creates glass, wherein the positronium cannot form. The movements of the alkyl tails are frozen and positronium cannot produce a bubble. With an increase in temperature the glass softens, which can be described as the formation of liquid-like domains. It is in these domains that positronium begins to form. Positron annihilation spectroscopy is used in the material testing of metals, semiconductors and polymers. The results of IFJ PAN prove that skilfully applied, this method can be a source of intriguing and detailed information about the structure of liquid crystals. "Positronium formation and annihilation in liquid crystalline smectic E phase revisited"; E. Dryzek, E. Juszynska-Galazka; Physical Review E, Vol. 93, Iss. 2, February 2016.
http://www.ifj.edu.pl/ The website of the Institute of Nuclear Physics of the Polish Academy of Sciences. http://press.ifj.edu.pl/en/ Press releases of the Institute of Nuclear Physics of the Polish Academy of Sciences.